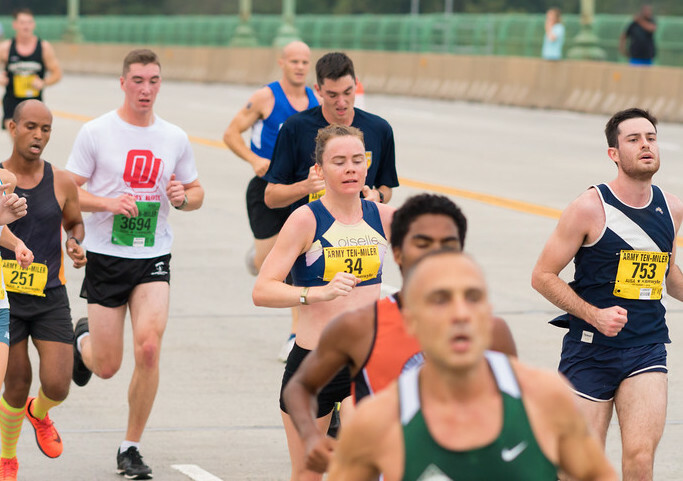 After the Navy Half, things seemed to turn around. The weather improved, workouts went better, the September slump was ending! 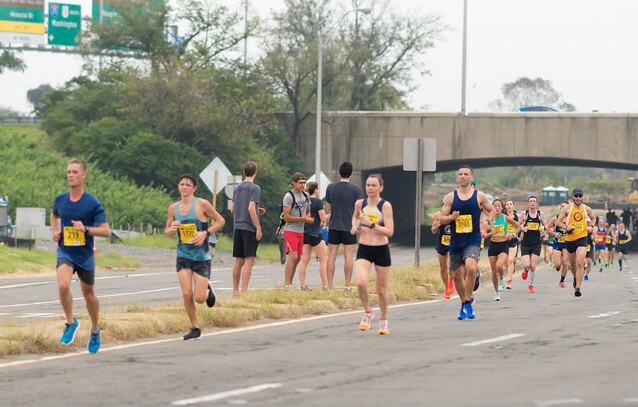 Maybe I could pull off the same comeback as 2014, when a bad September race was forgotten by a big PR at the Army Ten Miler and the trajectory of the season seemed to shift. But the weather had one last (please let it be the last!!) dose of humidity to smother us with, just in time for Army. I didn’t want a repeat of the Navy Half, where I completely crumbled in the second half, so I knew I had to adjust my goals even more. I put aside my hopes of PRing at this race and tried to take a more modest approach. I wouldn’t worry about outcome goals like time or place, instead I’d focus on process goals, which are more about strategies used and aren't affected by things out of our control (like weather and other competitors). My new goal became to negative split. I’d go out slow and pick it up at halfway. Surely I could do that and come away feeling successful, which is what I needed most of all. Mile 2. Taking it so easy I can do this with my eyes closed. I started slowly, a few seconds back from the line, and tried not to worry about the women surging ahead. But once again, it was hard to turn off my overanalyzing inner monologue. Is this easy enough?? I told myself it was and I hit 5 miles just over 6:10 pace, the slow end of my “start easy” range. OK, first part of the mission was a success. Surely I can pick it up from here. 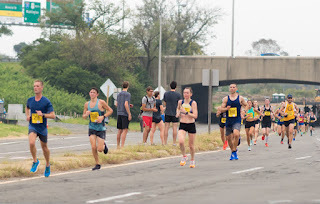 Around the loop by the 10K, I felt good, catching some of the men around me, feeling like I had another gear to shift to. 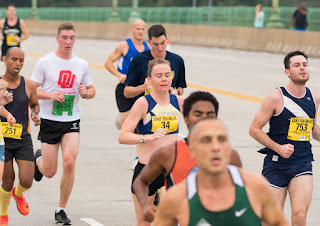 I caught a woman as we started up the long, endless (~2 mile) bridge/highway, and reminded myself this time I was racing smarter; catching people rather than being caught. But the next two miles were more of the same pace-wise, a hair over 6:10. I wasn’t actually picking it up at all. Mile 8 was even worse, the bridge hadn’t ended yet and went up ever so slightly to swing us around to the off ramp. The split was the worst of the day. Rather than getting faster, I was slowing drastically, again. I told myself to really push the last two miles, and coming off the highway (it’s always a joy to get the heck of 395) and seeing my family made me smile through the pouring sweat. But once more, the split was slower than expected, nearly as slow as mile 8. From the bridge onwards I had slowly reeled in a friend and I finally pulled alongside and slightly ahead in the last half mile. I finally found another gear to push with, but it seemed in vain given how ridiculously off my goals I was. At least I can make this mile the fastest. At least I can finish strong. 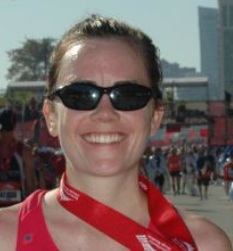 I finished in ninth, in 1:02:01. If I had known my chip time was so close to breaking 1:02 would I have kicked harder? I don’t know. I was so far off my early season goals it’s embarrassing. I didn’t even get my “surely I can at least negative split” process goal either, as my second half was 20 seconds slower than my “slow start.” Surprisingly, ninth is the highest I’ve ever placed at Army, which shows how much the weather slowed things (my best time at Army is almost 2 minutes faster). But I am, as always, so sick of blaming the weather. I know it affects times, obviously, but everyone is dealing with the same conditions. I seem to melt a little more: am I psyching myself out too early? Mostly I find that humidity saps me of my fight. I need to find a way to fight back harder. I hoped that Army would be the moment that things turned around, like they did in 2014. But I need to remember that I can’t capture 2014’s magic exactly, things will be different season to season. (Not least because the weather was nearly ideal for Army that year.) I continue to struggle with learning that lesson, that I can’t compare everything to previous seasons. I need to find a new way to make some magic this time around.